It is believed that the ancient, mysterious and hauntingly beautiful site of Petra in Jordan has been inhabited (in one way or another) for approximately 9000 years. Petra (Greek Πέτρα, Petra, meaning “stone”; Arabic: البتراء, Al-Batrāʾ) is a historical and archaeological city in the southern Jordanian governorate of Ma’an, that is famous for its rock-cut architecture and water conduit system. Another name for Petra is the Rose City due to the color of the stone out of which it is carved. 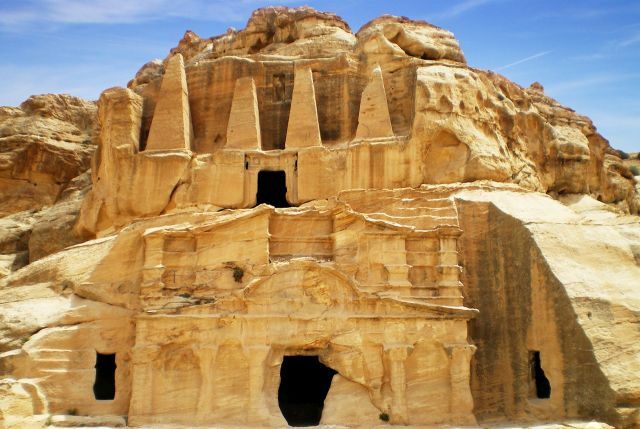 Established possibly as early as 312 BC as the capital city of the Nabataeans, it is a symbol of Jordan, as well as its most-visited tourist attraction. It lies on the slope of Jebel al-Madhbah (identified by some as the biblical Mount Hor) in a basin among the mountains which form the eastern flank of Arabah (Wadi Araba), the large valley running from the Dead Sea to the Gulf of Aqaba. Petra has been a UNESCO World Heritage Site since 1985. The site remained unknown to the Western world until 1812, when it was introduced by Swiss explorer Johann Ludwig Burckhardt. It was described as “a rose-red city half as old as time” in a Newdigate Prize-winning poem by John William Burgon. In Arab tradition, Petra is the place where Moses struck a rock with his staff and water came forth, and where his sister, Miriam, is buried. The word Petra (as with Peter) means “rock” and is derived from the Greek and Arabic language. It is a wonderfully appropriate name as this ancient city is literally carved from the rose-red sandstone hills and outcrops. As their power grew, the Nabataeans quickly gained control of the trade routes from the Red Sea to the coast of the Mediterranean. No one is precisely sure what goods were being moved but it is likely to have been incense, myrrh, spices, gold and copper as well as precious stones and even some slaves. It is recorded that in 312 B.C. the ruler of Syria, Antigonus I Monophthalmus (“the One-eyed“), who had succeeded Alexander the Great, initiated two great attacks on Petra. The first was led by Atheneus and the second by his own son Demetrius. Both military campaigns failed. The almost impregnable rocky defenses of Petra and the determination of the Nabataeans won the day. At the height of their power not only did Petra possessed the advantages of a natural fortress but controlled the main commercial routes which passed through it to Gaza in the west, to Bosra and Damascus in the north, to Aqaba and Leuce-Come on the Red Sea, and across the desert to the Persian Gulf. Unfortunately, not a great deal is known about the Nabataeans of Jordan although there are references and hints to be found in the history texts. The first mentions a Nabataean King Harith or Aretas and dates from the third century B.C. and refers to the sanctuary that he provided for the High Priest Jason of Jerusalem when Antiochus confirmed Menelaus, the brother of Simon the Benjaminite in his place and thus forced Jason into exile. A more accurate timeline of the Nabataean kings can be established from 100B.C. onwards based on the appearance of more written references. With the death of Rabel II in 106, the power of the Nabataeans became precarious. The Roman Emperor Trajan (Marcus Ulpius Nerva Traianus) already famous for his military success in conquering the Dacia nation ruled by King Decebalus in 106 A.D. pushed further east and finally conquered Nabatea in 107 A.D. Trajan ordered the governor of Syria, Cornelius Palma, to make Nabatea (Jordan) into a Roman province with the capital at Bosra. For the Nabataeans it was the end of their power and they began to decline as a nation although life for the average citizen probably went on as normal. The short-lived province of Arabia Petraea was formed and although Petra was no longer the capital of the region it appears to have continued to grow and do well under its new rulers and was even awarded the title of metropolis or mother-city. Even if it lacked true power, Petra still wielded tremendous influence in the region. For example, when Emperor Hadrian visited it in 130 A.D. he was so impressed with its magnificence and aura of mystery that he renamed it Hadriana Petra (Sometimes now referred to as Adriana Petra). Even as the Nabataeans declined the city experienced an influx of new people from Roman, Greek, Arabic and Semitic origin. This mixing of cultures must have made Petra a remarkable and lively place and is perhaps the reason why it continued to flourish for some time to come. It is during this period that many of the great monuments were constructed. However, Roman rule of the region was under constant threat and during the rule of Emperor Alexander Severus (222 – 235 A.D.) Just when the city of Petra was at the peak of its new power the first major disaster appears to have struck Jordan. Many historians attribute this to an invasion by the neo-Persian Sassanid Empire. Coinage stopped being minted and there is suddenly no more new and sumptuous tombs being built. The final decline of Petra had begun. One can only imagine and speculate what it must have been like as year-on-year fewer traders came to Petra as the city of Palmyra drew away the Arabian merchants. As time passed the city would have perhaps taken on a rundown appearance. A person can just imagine the remaining civic leaders talking over their food and debating when they too should leave. Records show that Petra in Jordan did continue to be a successful city and a centre of religion. Christianity had certainly well established itself in Petra by the 4th century A.D. – 500 years after the Petra had become an important trade center. Athanasius of Alexandria (293 – 373 A.D.) mentions a bishop of Petra named Asterius. At least one of the rock tombs (The Tomb of the Urn) was used as a church. We can only speculate what happened next. Did the remaining citizens quietly gather their belongings and, as a column of refugees, depart together for other cities or did they drift away over the years as it became obvious that without the water system and significant trade the city of rock was finally finished. Petra in Jordan was once again brought to the attention of the West by an explorer by the name of Johann Ludwig Burckhardt. During his time in Syria he had visited Palmyra, Damascus and Lebanon but was intrigued with the stories of a ruined and ancient city forbidden to foreigners. Pretending to be indifferent to Petra he persuaded his guides to take him though the Wadi supposedly on route to another destination and thus in 1812 became the first European to see the city and the tombs for hundreds of years. He died in 1817 but his book – Travels in Syria (Jordaan) and the Holy Land (1822) – compiled from his papers revealed the existence of Petra to the western world. As said earlier, the real mystery of Petra (Reqem / Sela / Rock / Jordan) is how little is known of its history and the nations that lived there. Hidden under the sands and rocks are still undiscovered tombs. As recently as 2003 a new series of rock cut tombs were discovered under the Treasury. The Hashemite Kingdom of Jordan has recognised the importance of this great archeological site and is making concerted efforts to protect and preserve it for future generations as well as making accessible to an often awestruck public.